Create crazy contraptions with wheels and rods to guide the pink object to the pink area. 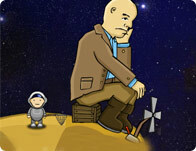 Use your imagination and knowledge of physics to come up with a solution for each level. Do you have what it takes to work your way from the photocopier to the presidents chair? Become a big time big business tycoon with a few mouse clicks and raise your empire to the sky. He has fangs, you have dots! Keep this beast at bay by locking him up in a Polka dot prison. Stop him from jumping away and use your puzzle master skills to lock him down! Dropping Christmas ornaments into a box is not as simple as it once was. You'll have to find the right path to bounce each of these into Santa's box.